This article will look at the recommended specifications for playing Battlefield 4 in light of recent announcements by AMD at their GPU 14 conference held in Hawaii. AMD recently announced Mantle, a new API (applicaton programming interface) to rival Microsoft’s DirectX, and games made by Electronic Arts using the Frostbite 3.0 engine will be the first to officially support it. 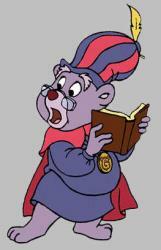 But does that mean that Battlefield 4’s GPU recommendations need a second examination? Mantle is a low-level API borne out of the research and work done on consoles in collaboration with Sony and Microsoft. 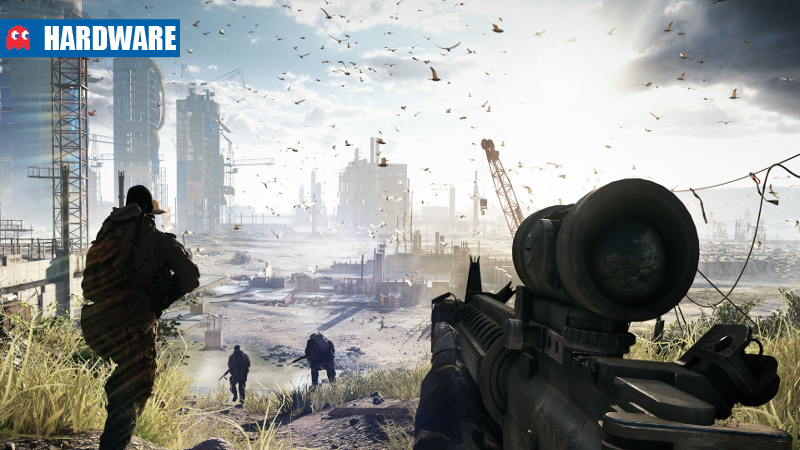 DICE is the first development studio to have lots of hands-on time with Mantle and will be updating Battlefield 4 to support it in December 2013. AMD paid a lot of money and offered significant developer resources to make this project happen. Mantle purports to make console ports easier and offers much lower overheads than DirectX, but its not going to win benchmarks by a landslide. What it’s going to do is allow for AMD to assist developers in getting games to run as efficiently on their hardware as possible. That means that if your rig packs in a GCN-based Radeon and has eight cores, the game engine will use every ounce of power available to it and will scale better to cheaper, less capable solutions. Keep in mind though that Mantle isn’t magical. GCN-based graphics cards and APUs won’t suddenly gain double performance overnight. Mantle shifts the potential bottlenecks of your system somewhere else – if a game is CPU-limited and supports Mantle, it may change its behaviour such that more than two cores are properly utilised for better overall performance. 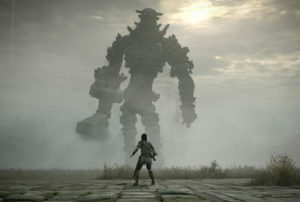 For any elements in a game’s engine that are not shader-bound, Mantle will improve performance enough to be noticeable. But EA and DICE are only a smart part of existing Mantle support. Frostbite 3.0-powered games will eventually have support for it, but on launch one can’t reasonably expect it to be there. For the most part new games will stick to, and launch with, the DirectX render path. However, this doesn’t change the fact that with the new Radeon R-200 series, the game changes significantly for Nvidia. 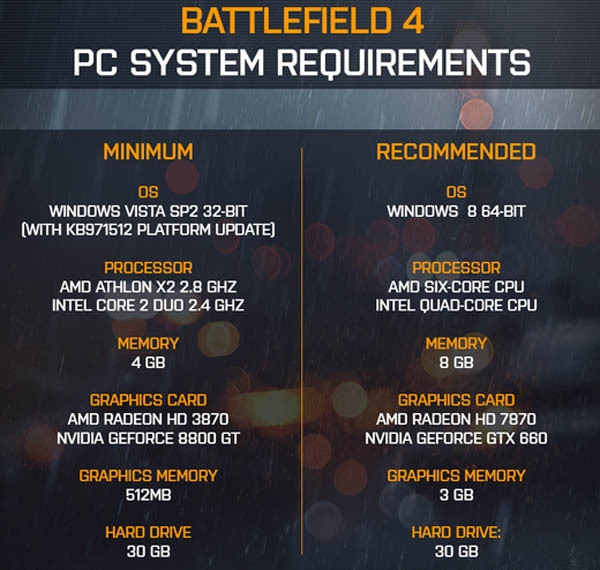 The table below shows the currently available and recommended graphics cards according to DICE’s system recommendations. This represents the graphics cards and the quality settings that should be playable. Note that I don’t include multi-monitor resolutions or 720p. Any card here will excel at 720p, while multi-monitor setups and 3D are still a niche application. For those of you who are looking for that information, any card from the Radeon HD7950 and up will be fine for both applications, although settings may have to be lowered to medium details to maintain a competitive and playable frame rate. Most of the low-end GPUs up to the Radeon HD7770 should have playable performance using FXAA to solve the problem of the low memory on those cards. The GTX650 Ti and the Radeon HD7790 should be able to run High settings and 1080p well enough to remain playable, although the Radeon R7 260X may be the better recommendation with the larger standard memory size. The top-end results and placings change as well. Because Battlefield 4 is a DirectX 11 title, any frame pacing and Crossfire improvements by AMD will have been made stable by the time the game has launched, which will put the Radeon HD7990 on top as the fastest dual-GPU solution available. Preliminary leaked benchmarks also place the Radeon R9 290X above the Geforce GTX780, hence its placement on the table. The GTX Titan is a notable omission, but a slightly overclocked GTX780 offers better performance for less money. All in all, AMD should be able to take the performance crown away from Nvidia on launch. Driver updates may change that placing later on and DICE remains committed to offering Geforce owners a satisfying experience as well. 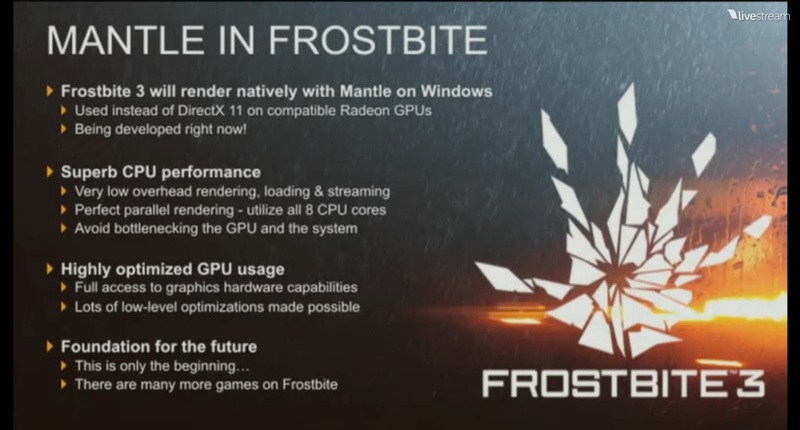 In the event that Mantle does offer sizeable performance improvements, I would expect the Radeon cards to only shift one line down, placing above their Geforce competition in benchmarks. However, it will not be able to magically work around memory limitations, so keep in mind my earlier warnings about the caveats of this new software.